SIFMA FoundationSixth grader Joshua Zirkiyev at the NASDAQ MarketSite after ringing the closing bell on November 10, 2014. Joshua Zirkiyev’s favourite stocks are Tesla and Alibaba. He is in sixth grade. Zirkiyev has spent the last three years investing virtual portfolios in school, through the nonprofit SIFMA Foundation’s Stock Market Game. 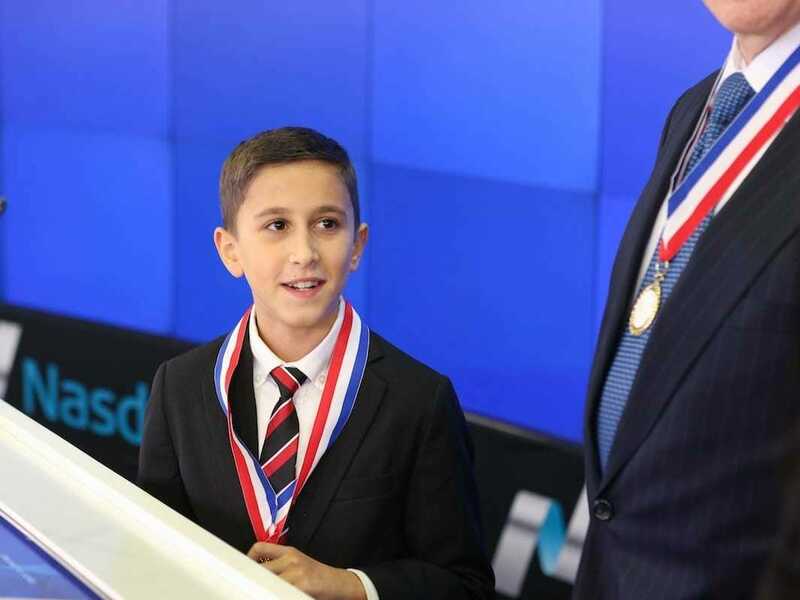 The game, offered as part of the curriculum at Zirkiyev’s Queens, New York middle school, allows over 600,000 students across the US in grades 4-12 to invest a hypothetical $US100,000 portfolio. 1. Do your research. Zirkiyev can’t stress enough how important it is to do your research on potential investments through charts and graphs on Google Finance, and he makes a good point: It’s always smart to look into a potential investment before signing over the cash, and some experts specifically caution against buying “hot stocks” without looking into them more deeply. 2. Look at the long term. On the subject of researching investments — specifically stock in companies — Zirkiyev advises taking a wide view. “Look at the long term,” he says, “how they have been doing since they started.” A company’s past doesn’t necessarily indicate how it will do in the future, but he’s right to look at the big picture. For most people, investing is a long-term game. 3. Know what’s coming up next. While again, an investment’s past performance can’t predict future results, Zirkiyev highlights the fact that some of the most lucrative investments are in companies on the forefront of technological advancement, like his favoured Tesla. “If some company is making typewriters, and there’s Apple making this advanced technology, who would buy typewriters now?” he asks. 4. Invest your savings. “There’s a higher chance, if you actually do research, that you will make more money [from investing],” he says. “With bank accounts, in one year, you just make 25 cents or something.” It’s usually not quite as dire as 25 cents, but he’s right that the interest earned on a savings account pales in comparison to the potential earnings through the stock market, or even compared to relatively conservative investments like index funds. In fact, this last point is the subject of the essay he wrote that won the 2012 SIFMA Foundation InvestWrite competition, and which we’ve republished on Business Insider with permission.